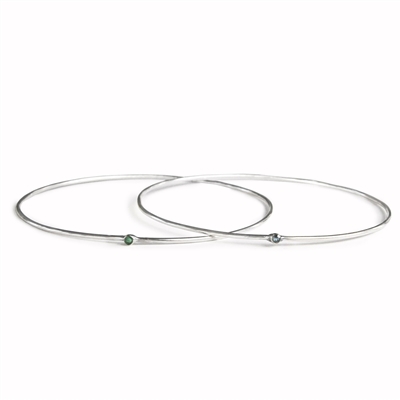 Sterling silver bangle bracelet with faceted emerald, ruby or sapphire. 7.5" inch diameter. 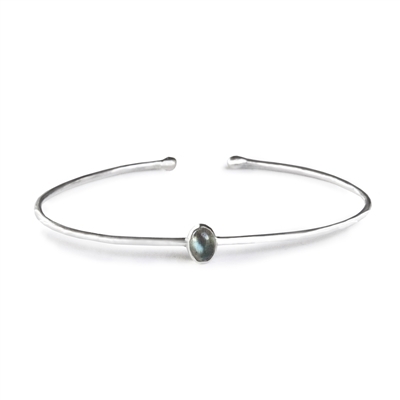 Sterling silver stackable bangle bracelet with a 8x6mm stone cabochon. 7.5" inch diameter. A sterling silver cuff bracelet with a small bezel set oval gemstone. Perfect for stacking. A naturally shaped and polished bezel set aquamarine and rope chain bracelet. Available as shown in sterling or in 14k gold filled. A sterling silver bracelet of a bezel set gemstone, faceted rondelles and chain. Finished with a toggle clasp. Approx. 7.5" L. Gemstone 3/4". 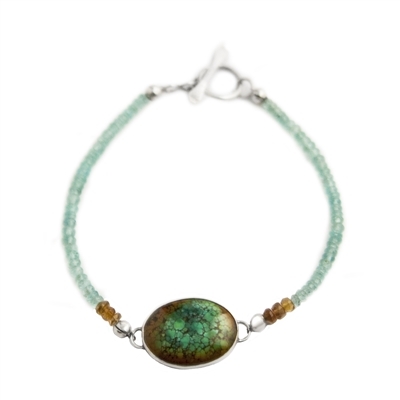 Sterling silver adjustable bracelet with natural chrysoprase. A cuff bracelet with different shaped natural gemstones in sterling silver. Shown in Peruvian opal. Each gemstone is about 10mm and bracelet width of 7" inches. Natural Occo geodes are wrapped in sterling silver and finished with a toggle clasp. Approx. 7.5" L, Each geode approximately 1" inch. A sterling silver double strand bracelet of faceted rondelles and an infinity sign. Sterling silver bracelet with two whale's tails. Adjustable 7.5". Each tail 3/4". Sterling silver bracelet with a prong set slice of natural amethyst geode and a bezel set amethyst cabochon. Sterling hammered silver bangle bracelet with bezel set stones. Each gemstone is about 3/4" inch. 7.5" inch diameter. Available in Peruvian opal, turquoise, and kyanite. A sterling silver bracelet with a bezel set gemstone and faceted rondelles. Finished with a toggle clasp. Sterling silver bracelet with three bezel set gemstones. Adjustable size. 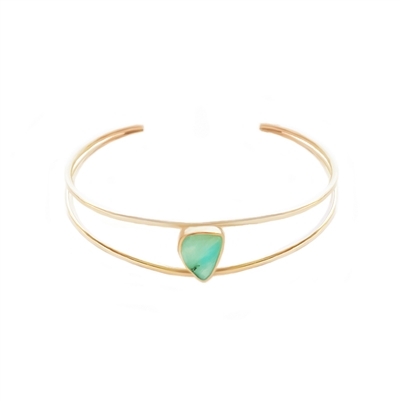 A cuff bracelet with different shaped natural gemstones in 14k gold filled. Shown in Peruvian opal and rainbow moonstone. Each gemstone is about 10mm and bracelet width of 7" inches. Sterling silver and natural stone bangle bracelet. Available in multiple stone combinations. No two bracelets are alike. 7.5" inch diameter. 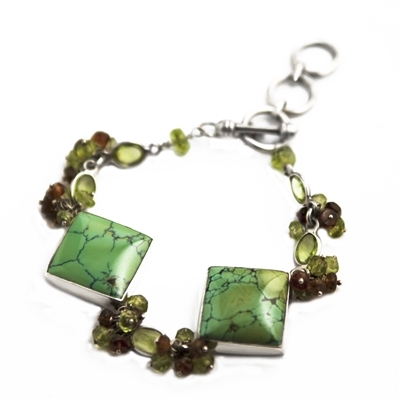 A sterling silver bracelet of bezel set turquoise, peridot and faceted tourmaline rondelles.